I was excited to cook Saint Jacques, or scallops, in Paris mostly because doing so would require me to shuck them myself. Something I thought I would do this winter on Martha’s Vineyard, with dreams of being invited on a scalloping boat or at least to a shucking “party” (I am still enthused about the idea…hint hint! 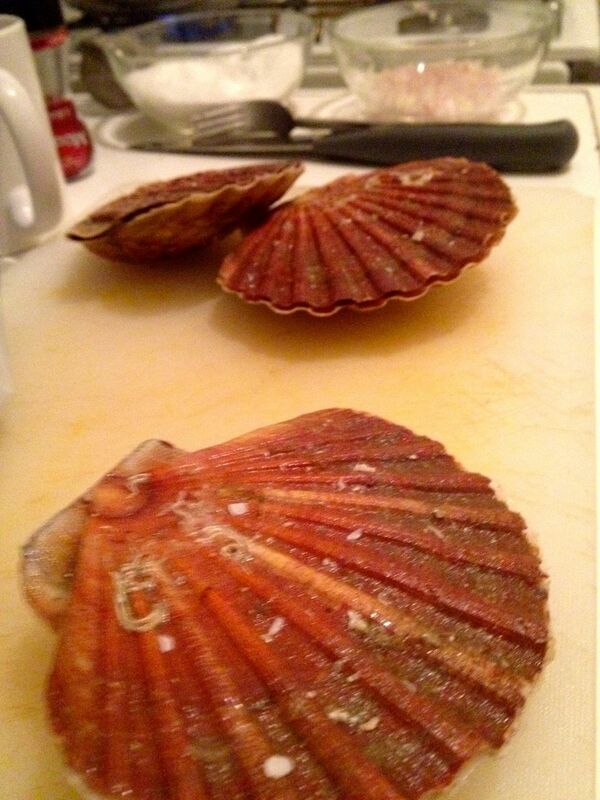 ), I actually shucked scallops, for the very first time, yesterday! I bought the Coquilles Saint Jacques excitedly, telling the vendor at the indoor market (like a farmers market only indoors) that in America, you can never buy the scallops inside their shells! I said it as if it were an added bonus to have to do the work of shucking yourself. The vendor mumbled something about Americans having the right idea, to sell them pre-shucked (compliments towards Americans seem to be doled out more frequently in the post-Bush era). But the prospect of this task that would connect me more intimately with the little mollusk creature made me feel that the French were geniuses! Such a task would require the chef to appreciate the product more. The scallops still were not cheap, even though no shucker had been paid for the bushels and hours of shucking. Eight of them cost me just over ten euros! And they were small. Still, with the other components to the meal, they managed to feed three people. Would you like me to shuck them all for you? The vendor asked me, when I beseeched him to show me just one. No No, I will do it myself, I fervently replied! He made it look so easy. Stick the wide knife inside the shell, and with the slight twist of the wrist, pop it slightly ajar. Use the knife to tear the mussel just at the “bow tie” of the shell. Open the shell while dragging the knife across the top of the shell, cut off the organ (the black part, which I think is an organ? ), and the remove the various inedible parts. The vendor left the orange sack on the one he demonstrated, saying that in France people eat that part, or make a sauce out of it. That went against my restaurant-honed sensitivity toward removing every tiny muscle from the scallop, even after it is delivered shucked and cleaned. Once home, I had completely forgotten which side was up and which was down. My scallops were sticking to the top (or bottom) of the shell and I would lose a little bit of the surface, which would prevent it from searing evenly since the surface was no longer smooth. Cutting out the organ was messier for me than for the vendor, too. I often cut into it, releasing some of that black gooey-ness (bile?). Oy Vey. Like everything else, this technique takes skill. My first experience brought a little sweat to my brow. It made me care for the scallops in a new way though, hoping to bring them out of their shells intact, like they were precious babies being born into the world, though the truth is, I was bringing them closer to death. But I still wanted their death to be a pretty one. And ultimately it was. The dinner, below, was scrumptious. 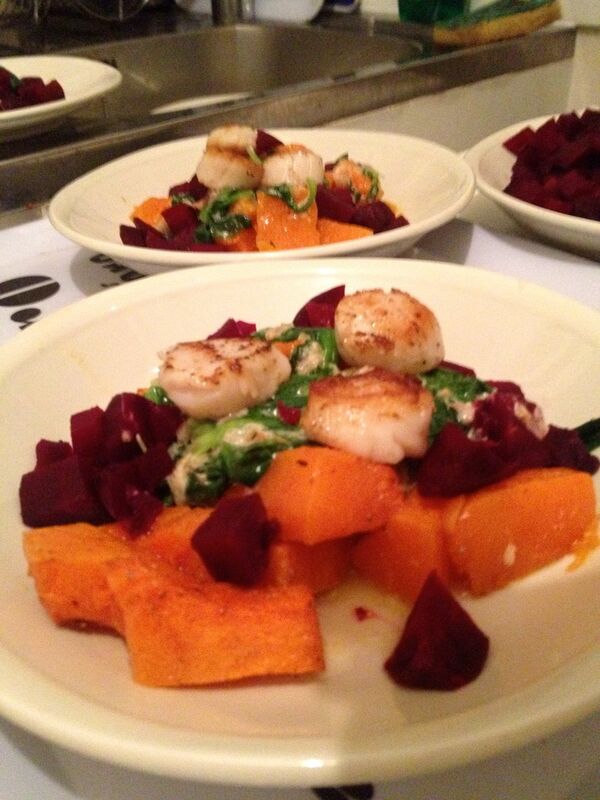 Roasted Squash with a hint of cinnamon, braised beets, topped with creamed mache (a green similar to spinach) and seared scallops. YUM! I just ate scallops at Moxie last night, which is my favorite place to be lately, and I think it is possibly because when I am there I feel a little like I could be in a cafe in Paris… SO glad you are having an adventure. It’s inspiring me to put on my traveling shoes again at some point this year. Can’t wait to cook some yummy food with you when you get back!